Oprah Winfrey, 58-year-old media proprietor, is allegedly getting fired from her own network. Winfrey's OWN network has reportedly brought in lower than expected ratings, causing her co-owners at Discovery Commu­nications to question her position. The company is looking to find someone else to fill Winfrey's position, according to the National Enquirer. "They now realize that she was too inexperienced to run the net­work," an insider reportedly told the publication. "So she was stripped of her power. She's no longer in a position to make executive decisions or hire staff without consulting top Discovery executives first." Winfrey was already informed about the decision in a meeting which left her "feeling as if the wind had been knocked out of her," the insider reportedly said. According to the publication, the OWN network has turned into a personal failure for the media personality and proprietor. "For Oprah, this is a bitter personal failure and a devastating blow to her ego," the insider told the Enquirer. "The unexpected demotion has sent her into an emotional tailspin so severe that friends are deeply concerned for her. They fear it could trigger one of her drinking and eating binges." While the Enquirer's reports remain unconfirmed by Winfrey or the network, OWN has been promoting the upcoming guests of Winfrey's show, "Oprah's Next Chapter." The 14-year-old daughter of late singer Michael Jackson is slated to appear on the show where she reveals the difficulties of dealing with her father's death. "It never gets easier," Paris Jackson tells Winfrey about her father's death in a preview of the episode. Winfrey also interviewed rapper Curtis "50 Cent" Jackson for the show, years after he criticized her impact on the black community. "I think she caters to older white women," Jackson told The Associated Press in 2006. "Oprah's audience is my audience's parents. So, I could care less about Oprah or her show." However, Winfrey and the rapping entrepreneur will reportedly clear up feuding rumors in their interview that was conducted at the home of Jackson's grandmother. The episode featuring Paris and 50 cent will air Sunday on the Oprah Winfrey Network. Oprah Winfrey Planning Kardashian Style Wedding to Save OWN? 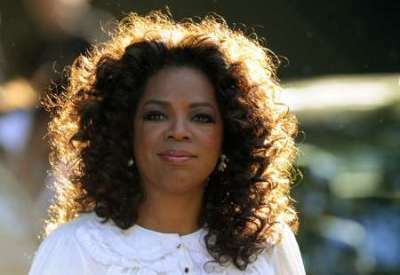 Oprah Winfrey Confesses Christ During NYC 'Lifeclass' Tour?